Results From Content Marketing - How Long Does it Take? How Long Should You Wait to See Results from Content Marketing? Content marketing has become so universal in recent years that some pundits are suggesting we just call it marketing. The model of finding new customers by publishing and promoting relevant content has proven itself over time to be effective and efficient. As many as 42 percent of B2B companies now say that their content marketing efforts are yielding real, quantifiable results—a dramatic surge in satisfaction and effectiveness ratings from last year. Businesses are getting smarter with their content strategies, and as a result, they’re seeing more success. However, there remains a large contingent of marketers who are unsure whether their content marketing efforts are paying off. Content marketing can be expensive, and it’s hard to continue allocating resources to a marketing initiative that isn’t yielding tangible results. The fact of the matter is that content marketing, when done correctly, always works. It just takes time. There are certain things you can do to speed up the process, of course, but for most businesses, content marketing is a long-term investment. All of this begs the question: How long? How long is it reasonable to wait before pulling the plug on the experiment? At what point should you be able to expect tangible results? SaaS is a unique corner of the marketing world. Because they’re selling something intangible, something that is constantly changing, SaaS marketers need to work creatively to be successful. The sales cycle in SaaS is much shorter than it is in similar, big-purchase scenarios. Customer support and service are more important than in perhaps any other field. What Patel is describing is virtually a textbook definition of content marketing. SaaS providers have a huge leg up on more traditional companies in this department. Customers already expect to receive information and helpful content from SaaS publishers. Many SaaS websites and blogs are already treated as authoritative sources. If you’re already using your media channels to onboard new users, congratulations! Content marketing is beginning to work for you. Of course, this is only the beginning, but you can take some comfort in the knowledge that content marketing is uniquely tailored to complement SaaS, and that your wait for results might not be as long as that of more traditional marketers. Because most SaaS providers already have the basic infrastructure necessary to succeed, it should be easier for them to launch large-scale content marketing initiatives. It’s like being in the fast track at Disneyland—you get to bypass most of the deadlock. However, you’ll be disappointed if you expect to be immediately waved through. The general consensus is that properly executed content marketing campaigns should yield initial results within six months. There are hundreds of reasons why companies sometimes fail to see results within that time period, but most marketers, both inside and outside SaaS, see results by then. It’s important to understand that the first results may not be dramatic. In fact, it’s unusual for companies to see huge upticks in their sales during the first year. The initial results are usually a gradual increase in page visits, social reach, and brand recognition. Companies that stick with their content marketing strategies can expect the following months and years to bring improved search rankings, lead volume, web traffic and, of course, sales. The ultimate result of successful content marketing is a large body of loyal, repeat customers and an authoritative presence online. The fact that content marketing creates a sustainable increase in loyal customers is particularly valuable to SaaS companies, who rely heavily on repeat business. Gartner reports that fully 80 percent of future revenue for SaaS companies comes from just 20 percent of their current customers. Increasing customer retention by just 5 percent can increase profitability by 75 percent. Content marketing is about making friends with your potential customers. It’s hard to make friends overnight, but once you’ve found them, they’ll stay with you for a long time. The reward is worth the wait. All of this sounds wonderful, but what if you haven’t seen the results you were expecting after six months? It’s not an unusual problem. If 42 percent of B2B marketers feel that their efforts are effective, by default, this means that 58 percent are frustrated and dissatisfied. Fortunately, most content marketing failures are due to operator error. There are simple, measurable things marketers can do to troubleshoot their content marketing dilemmas and hasten the results. The Internet is full of articles offering solutions to content marketing problems, but most of the suggestions they offer – boil down to a few key points. 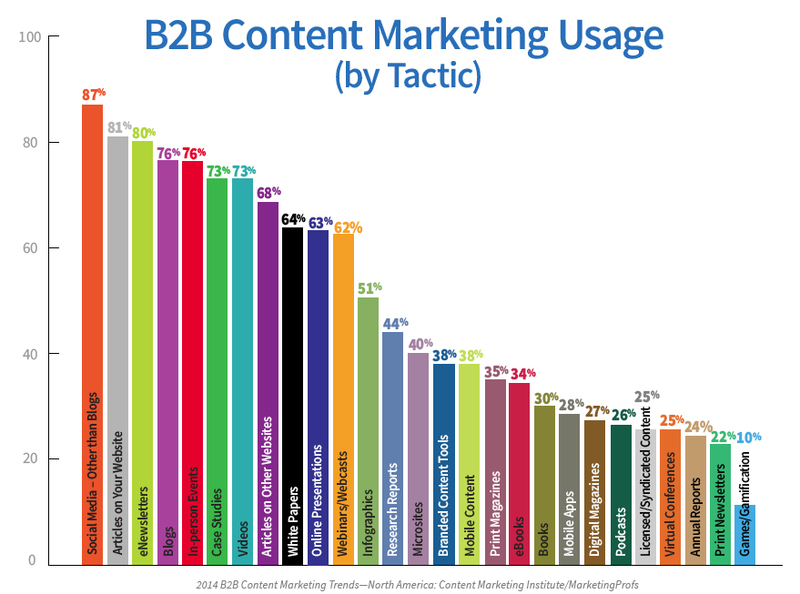 Only 27 percent of marketers report having a documented content marketing strategy. The rest report having an undocumented strategy, or none at all. It goes without saying that entering a long-term, potentially expensive marketing initiative without a plan is a recipe for disaster. Content marketing without a strategy is just random publishing—it would be crazy to expect substantial results. Make sure everyone on your marketing team has a clear understanding of your content marketing objectives. Work together to build a realistic, sharply-focused strategy that’s designed to produce results. This is the most important step you can take towards success. “Content” is a very ambiguous word. It can mean anything from blog posts and infographics to videos and quizzes. Some types of content engage readers better than others. For instance, quizzes and infographics tend to perform better than traditional articles. Good content is like a conversation. Readers like to participate, whether it’s in the comments section or by inputting answers on a quiz. Research indicates that 91 percent of buyers prefer interactive or visual content over traditional, copy-heavy material. Most marketing content on the Internet is recycled. A high authority blog publishes a piece with original research and then over the coming days and weeks, hundreds of smaller publishers scavenge the research and spin it into their own content pieces. This works, but it’s inefficient and a bit disingenuous. If your content looks and sounds similar to everybody else’s, you aren’t going to see the results you want. Consumers are already saturated with information. They don’t want to see or read more of the same. Do everything you can to publish original, carefully researched and creative material. By doing so, your authority will quickly improve. Need some help? No worries – download our 5-step checklist for creating conversion-driven blog posts. Rest assured, this will help you create the unique content your up-and-coming “brand fans” crave. Many marketers approach content marketing from the wrong angle. It’s unquestionably an excellent way to boost brand awareness and grab a larger audience. However, these two benefits don’t translate immediately into sales. In order to see tangible results quickly, content marketing should be geared toward generating and converting leads as well as building web traffic and brand awareness. The best content marketing works as a cog in a larger marketing machine. It serves to generate leads and funnels them towards reps and meaningful dialogues that will eventually lead to sales and revenue for the company. After all, if your only objective is to build powerful media channels, success doesn’t need to include more revenue. Make sure you know what you want from your content marketing. Sometimes businesses have everything figured out—they have a solid strategy, unique content, realistic expectations, and solid promotional channels, but they fail to produce enough content to keep the “machine” operating properly. Content marketing is to some degree a numbers game. It takes a lot of blog posts and articles to build page authority. It takes a lot of tweets and mentions to generate a sale. Make sure that you’re producing and publishing enough high-quality content to hold your audience’s attention. You want to come out of this with more to show than a few stellar blog posts. Few elements of the digital marketing mix have more to offer businesses than content marketing. For those who harness it effectively, it creates a lasting pipeline of sustainable sales. If you have the patience and the attention to detail to mount a successful campaign, you can expect to see appreciable results within six months, and real, dramatic improvements within a year. Like anything valuable, a great content marketing system takes time to develop. Don’t lose hope if you aren’t able to see results immediately. As always, good things come to those who wait.